Hey crafty friends! Welcome back to another Southern Girls Challenge reveal. Team Lou was challenged to use tags in their creations this go around…easy peasy right!? 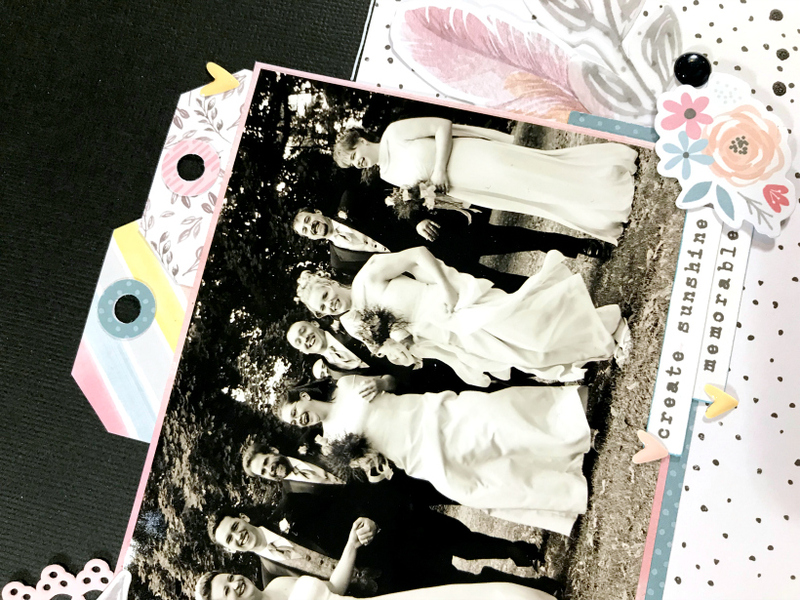 I choose to create a wedding party scrapbook layout with one of the fun photos from our wedding shoot. I started with paper from Cocoa Vanilla Studio’s More Than Words collection that I received in my second Secret Not Secret Kit club box. Khristina has included three Cocoa Vanilla collections in my boxes and I think they are my top favorite company…EVER! I haven’t created a layout with their products I haven’t loved. You can see here I created tags from scraps of paper and tucked them under my photo. I also used my We R Memory Keepers hole reinforcement punch to complete the tag look. I couldn’t decide on a twine color so right now they are empty. What color would you vote for? By the time I was creating this layout I didn’t have much left from my kit so you’ll see how I used the partial sheet of paper with a black piece of cardstock and the punched border to make up the 12×12 size. I also added the white doodle border around the top to tie the white from the bottom in with the solid black on the top. Some thickers, black splatters and enamel dots let me call this one day and get it done in under an hour. 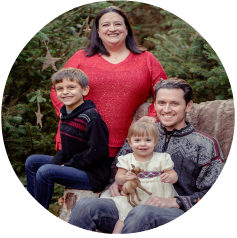 I’m very happy to be getting these memories documented as we celebrated our 13th wedding anniversary this summer. Thank you for joining me today and I rambled on, and I hope this has inspired you to create something to join in on the challenge. As always, love your comments and if you do create something inspired by this…leave me a link so I can come and see. Until next time….stay crafty! Hey crafty friends! 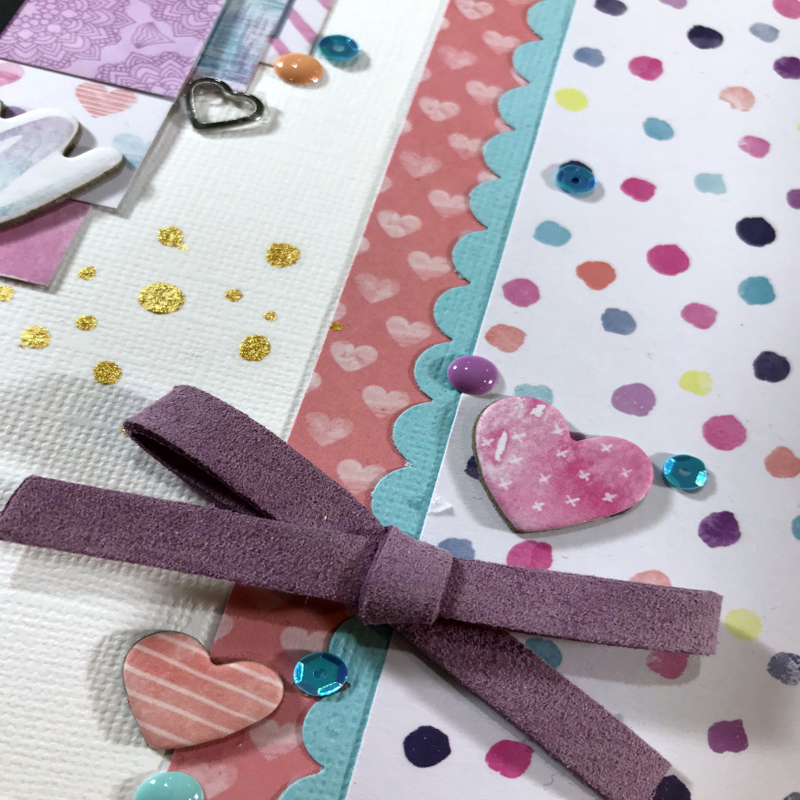 I’m here today sharing my second layout for Scrap Our Stash. For the second challenge of the month we needed to blend elements of two sketches, and also add sequins. I used parts of each sketch to create a primarily purple wedding scrapbook layout. Both sketches had a long element strip…one on the left side and one in the middle. I took that idea and used a strip of paper along the right hand side and added a border to it since the paper I had left didn’t see quite wide enough once I placed my photo down. Both sketches also had a relatively small title. Since this was a wedding photo it didn’t need a big explanation so I used the small title idea and used just a single chipboard word from the collection I was working with. The second sketch also had heart as the main embellishments. I used some chipboard hearts, metal hearts and two patterned papers that had hearts in them. You can also see some of my added sequins in this photo. Have I shared with you before that I found a new way to attach my sequins that works so much better than liquid glue!? Zots for bling are so much easier to work with for things this small, and you never have any dried glue showing. Last but not least I saw that both sketches had a banner someone in there. To use this portion of the sketches I added a patterned paper banner under my photo. I also added some chipboard banner words at the top to bring the concept into another area of my layout. So how do you think I did combining the sketches? Can you see the originals in there anywhere? 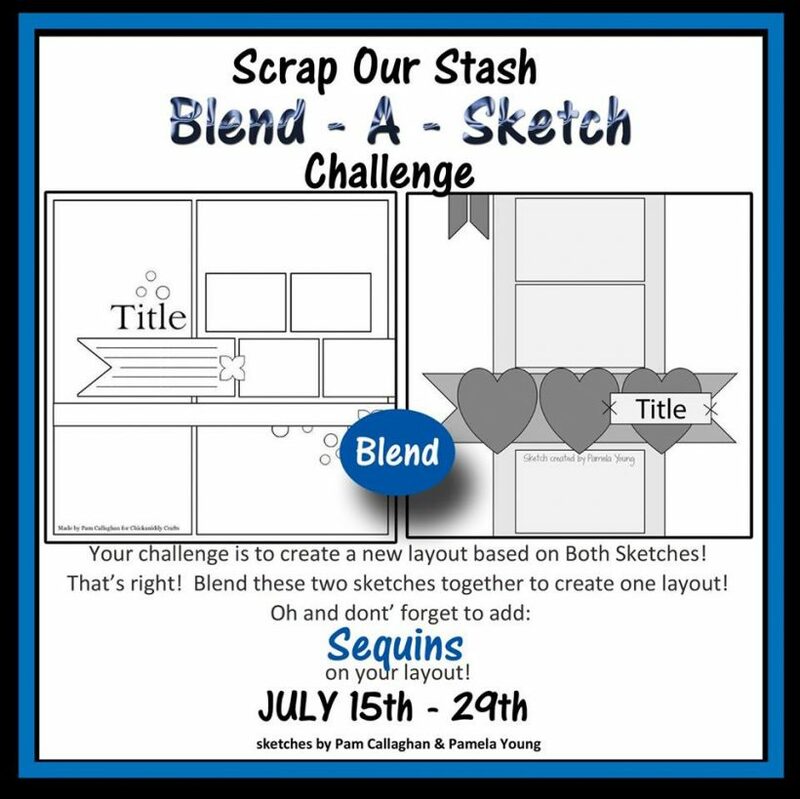 Be sure to head over to Scrap Our Stash and see what the other design team members created, and I can’t wait to see your creations as well. Until next time…Stay crafty!